The final four skippers emerged today at Stena Match Cup Sweden with defending event champion Bjorn Hansen of Nautiska Racing and Australia’s Keith Swinton of Black Swan Racing each heading into the final day at match point in their respective Semi Final matches against opponents Taylor Canfield and Ian Williams' GAC Pindar. Earlier in the day, Hansen and Williams both made short work of their Quarter Final opponents, Italian Simone Ferrarese and Kiwi Reuben Corbett respectively ending their hopes of Stena Match Cup glory 3-0. Racing today was held in a southerly wind of 12-15 knots, which meant the course was placed across the fjord forcing the race management team to run three lap matches. In the third Quarter Final Taylor Canfield’s US One team faced Phil Robertson (NZL) Trefor Match Racing. In one of the most fiercely contested knockouts former ISAF World Champion Canfield was pushed hard by the Kiwi skipper, this week standing in for usual Trefor helm Nicolai Sehested (DEN) who has had prior commitments with Team Vestas Wind in the Volvo Ocean Race. Robertson was fast out of the blocks taking the first race, but Canfield came back and in a measured display of match racing took the following three wins and booked his slot in the Semi Finals. Keith Swinton has been flying a little bit under the radar this week quietly collecting points throughout Qualifying and then picking the local team of Johnie Berntsson (SWE) for his Quarter Final, maybe not such a wise choice in terms of gaining popularity but as a recent Gothenburg resident, Swinton feels like a local himself with a number of Swedes amongst his crew. Berntsson took first blood but couldn’t keep a resurgent Swinton under control and the Australian skipper came back to close the match 3-1 and send Berntsson to the rocks to watch the rest of the event amongst the thousands of spectators who line the shores of Marstrand fjord. Two Semi Final matches were held and both went 2-0. In the first Bjorn Hansen got the measure of Taylor Canfield to go to match point and leave Canfield needing to regroup over night as they will need to win three straight tomorrow. In the second Semi Final it was Keith Swinton that surprised many by inflicting two wins against the undefeated Ian Williams, thus piling the pressure on the British team. On beating Williams twice in quick succession Swinton added: “It's hard to go undefeated for that long so it was good to break that streak and then go and to do it again!”. Racing will resume tomorrow at 1030 CET to complete the Semi Finals and move onto the Finals at 1300. With light winds forecast it will be a tricky day for competitors and the race management. 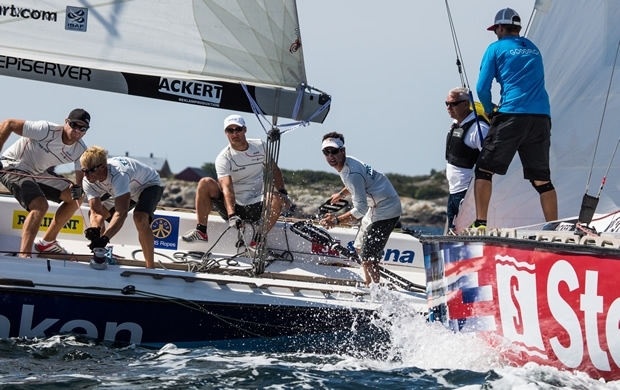 What is guaranteed is a huge reception for whoever lifts the 2015 Stena Match Cup by the enthusiastic crowds expected in Marstrand.